1. Burj Khalifa is located in Dubai, United Arab Emirates (UAE). 2. It’s 828 metres tall (2,717 feet). 3. The exact height was not revealed until final stages of the construction. 4. It was officially opened on Jan 4, 2010. 5. It was previously known as Burj Dubai. 6. Burj means Tower in Arabic language. 7. It’s renamed after Sheikh Khalifa bin Zayed Al Nahyan, the President of UAE and ruler of Abu Dhabi. 8. Tallest building – previously Taiwan’s Taipei 101 (509m). 9. Tallest free-standing structure – previously Canada’s CN Tower (555m). 10. Tallest man-made structure – previously USA’s KVLY-TV Mast (629m). 11. Tallest man-made structure ever – previously Poland’s Warsaw Radio Mast (647m). 12. Building with most floors (160) – previously USA’s World Trade Center (110). 15. Highest mosque at 158th floor. 17. Fastest elevators at speed of 64km/h, or 18m/s. 18. It would take just a minute to reach from ground level to top floor. 19. Burj Dubai has more than 162 floors. 20. It has 49 office floors. 21. It houses 1044 residential apartments. 22. It has a floor area of 334,000 square metres. 23. There’s 57 lifts in the tower. 24. There’s 28,261 of glass-panels on the exterior of the tower. 25. Its top spire can be seen from 95km afar. 26. The architecture features a triple-lobed footprint, an abstraction of the Hymenocallis flower. 27. The Y-shaped floor plan aims to maximize views of the Gulf. 28. Over 1,000 pieces of art from prominent Middle Eastern and international artists will adorn the tower and the surrounding Emaar Boulevard. 29. The tower’s peak electricity demand is estimated at 50MVA, equivalent to roughly 500,000 100-watt light bulbs. 30. It’s expected to use an average of 946,000 litres of water each day. 31. During peak cooling conditions, the tower will require around 12,500 tons of cooling, equivalent to the cooling capacity of about 10,000 tons of melting ice. 32. Construction began in September 2004. 33. The tower’s architect and engineer is Skidmore, Owings and Merrill (Chicago). 34. The main constructor is Emaar Properties, a joint venture by Korea’s Samsung C&T, Belgium’s Besix and UAE’s Arabtec. 35. The construction project manager is Turner Construction Company. 36. Bill Baker is the chief structural engineer. 37. Adrian Smith is consulting design partner. 38. It took some 22 million man-hours to be completed. 39. On downside, foreign construction workers were pay as little as $4 per day. 40. Over 45,000 cubic-metres of concrete, weighing more than 110,000 tonnes, were used. 41. Concrete used was enough to lay a 2,065km-long pavement; and equivalent to the weight of 100,000 elephants. 42. Total weight of aluminium used is equivalent to that of five A380 aircraft. 43. Total length of stainless steel bull nose fins used is equal to 293 times the height of France’s Eiffel Tower. 44. The foundations were dug to depths of 50m. 45. Total cost estimated at US$1.5 billion. 46. The price for the offices spaces reached as high as US$4,000 per sq ft.
47. Residential spaces as high as US$3,500 per sq ft.
48. The building is part of the a 490-acre flagship development called Downtown Burj Khalifa. 49. 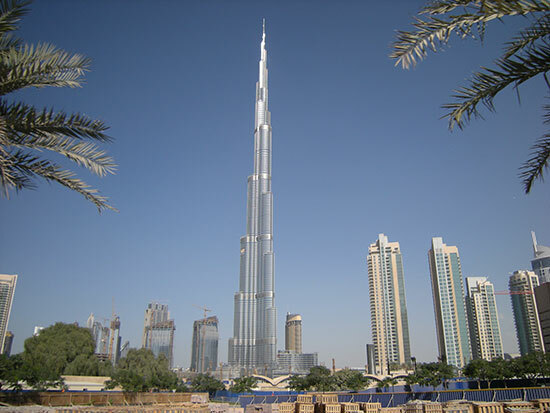 Burj Khalifa is about twice the height of Empire State Building (443m). 50. It’s taller than Hong Kong’s Victoria Peak (552m). 51. It’s the first world’s tallest structure in history to include residential space. 52. It will feature the world’s first Armani Hotel, which occupies 15 of the lower 39 floors. 53. The exterior temperature at the top of will be 6°C cooler than its base (some say 10°C). 54. Jan 4, its opening date, was the birthday of Sir Isaac Newton. 55. Around 12,000 people are expected to live and work in the tower when it’s fully occupied. 56. The tower’s official website is www.burjkhalifa.ae.